The entire stud mainly defines the different aspects of the climate change over worldwide. Along with that, it also defines the fact how this environmental change creates impact over the coral reefs. In addition to that, this particular study also defines the fact that how the different anthropogenic activities affects the coral reefs. 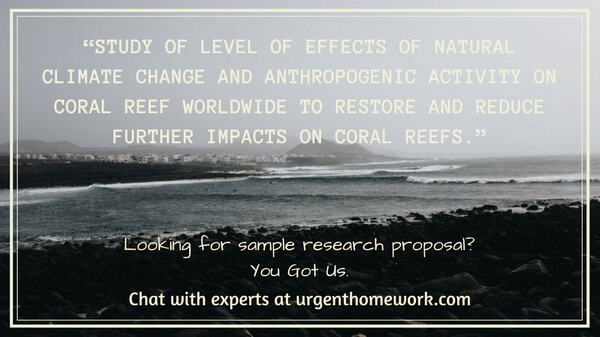 Moreover, the study also needs to find out the way through which the impact of the climate change can be reduced over the coral reefs. The coral reefs mainly deliver the ecosystem services to the protection regarding the coastline and the fisheries. Along with that, the coral reefs also protect the shorelines by taking the energies of the waves and the fact is that there are many small islands exists in the world, that would not exist without the coral reefs regarding the fact that the reefs protect them. Therefore, it can be said that the entire project, mainly deals with the different aspects regarding the safety of the coral reefs. Although the coral reefs have an ample amount of importance, still these wildlife homes are getting g destroyed throughout the entire world. Berumen et al. (2013) said that near about 75% of the coral reefs are under threat now and along with that, many of their species have been lost. One of the main reasons behind this particular problem of the coral reefs is the enhancing temperature of the seawater (Bourne et al. 2015). Whenever the temperature of the seawater gets too high, then the relationship in between the symbiotic microalgae and the corals broke down. The algae are considered as the components that mainly provides color to the reefs. Therefore, the reefs become bleached. Along with that, one thing that needs to be taken into consideration that if the temperature is high for a longer time period, then it would be tough for the reefs to get recover from that situation. Along with the rise in the temperature, Brandl et al. (2014) said that the acidification of the ocean water is also considered as another problem regarding the destruction of the coral reefs. Therefore, the balance in the ecosystem is disrupted. Along with that, the various animals staying in the water also is hampered by this environmental disruption. In addition to that, the majority of the seafood production needs to have a proper study regarding the coral reefs. As the coral reefs are considered as the most important component of a particular nation that can bring in the balance in between the ecosystem and can generate an ample amount of revenue regarding that, therefore this particular topic has been taken under consideration. The temperature of the air along with the surface temperature of the ocean that mainly brought on by the change in the climate has an immense amount of impact over the coral reefs and they altered the ocean chemistry. Therefore, it mainly creates a high level of impact over the coral reefs along with the organisms that mainly use the reefs as their home. According to Brooker et al. (2014), as the coral reefs are very much sensitive towards the temperature, therefore the increased level of water temperature that creates the change in the climate can create an immense amount of impact over the coral reefs. If the temperature of the water stays at a high range, then the coral turns white. These corals are known as the bleach corals. This bleach corals are very much weak and they are less combat to the different disease. First, in 1998, the bleaching of the coral reefs has been seen (Chong-Seng et al. 2014). A less amount of bleaching can be seen on the coral reefs in the Pacific islands in the season of summer. However, there have been some times when the concepts of coral bleaching get worst in that particular region. Along with that, the amount of carbon dioxide that gets into the atmosphere mainly dissolves into the ocean. Davis et al. (2014) said that the oceans have taken near about 1/3 of the total amount of carbon dioxide that has been produced due to the different human activities. As the level of carbon dioxide enhances in the ocean water, therefore the level of pH decreases and the ocean water becomes more acidic. This is known as ocean acidification. The concept of ocean acidification mainly makes the coral reefs disable to absorb the calcium carbonate that is very necessary for them in order to maintain their skeleton. Depczynski et al. (2013) said that the ocean acidification has reduced the level of pH near about 0.11 units. Therefore, it is very much necessary to reduce the amount of carbon dioxide emissions in the environment. Otherwise, the ocean acidification would also enhance the number of damaged coral reefs. The ocean acidification does not only affect the corals, it also affects the snails along with the urchins that make the calcium carbonate shells also weak. According to Den Haan et al. (2014), if the production of the carbon dioxide grown in the current rate, the rate of carbon dioxide would be high, enough in order to destroy the coral reefs as the level of pH would be decreased. The amount of increased level of greenhouse gases that are generated from the different human activities that mainly results in the climate change and the ocean acidification. The change in the climate mainly drives the change in the ocean. According to Fulton et al. (2013), the oceans mainly absorb a large amount of carbon dioxide from the environment, however, the global warming is restricting them from this particular aspect and the absorption of carbon dioxide become less. The burning fossils along with the production of the different industrial elements mainly keep the temperature of the environment at an enhanced level. The change in the climate mainly leads to a warming ocean. This aspect mainly contributes towards the coral bleaching along with the different infectious diseases. In addition to that, it enhances the sea level water and makes certain changes in the pattern of storms (Glynn and Manzello, 2015). The sedimentation that means the loosing soil from the upland areas is considered as an important cause regarding the destruction of the coral reefs. The construction at the coastal side along with the development of that area mainly results in a huge sediment loading. Along with that, the improper management of the lands and the deforestation mainly causes the entire effects. In addition to that, Graham and Nash (2013) said that the chemicals that are being applied to the land, make their way down to the reefs through the rivers. Along with that, the degradation also has an ample amount of effects over the coral reefs. The effect that creates the most impact over the coral reefs is from the suspension of the splits, reduction of the oxygen level and the release of the different toxic matter. In addition to that, the sedimentation mainly requires an enhanced level of energy that needs to be diverted from the different processes. However, according to Jackson et al. (2014), if the problems are generated by any other circumstances such as the rise in the temperature, then the corals may become overstressed and may subject to die. The coral reefs mainly contain the activity of biodiversity. They are considered as the most diverse ecosystem over the earth. Diversity is very much important for the different set of reasons. The term biodiversity mainly ensures the fact that there is some life that will continue to survive even after some major changes in the overall environment (Kemp et al. 2015). Along with that, the bio-diverse ecosystems also provide a different kind of services that would be very difficult for the humans in order to create those services artificially. Along with that, the coral reefs are able to produce food for a large number of humans. In addition to that, the coral reefs are also able to protect the land. The reefs are able to use the wave energy from the different storms and can easily reduce the amount of damage to the adjacent lands. Moreover, the coral reefs are also able to supply the natural medicines. As they have the nature of biodiversity, therefore the different natural resources can easily be found in the coral reefs (Lantz et al. 2014). According to Den Haan et al. (2014), in order to reduce the negative impact over the coral reef, the humans need to be very much aware regarding some facts. One of them is the fact that humans need to reduce the use of carbon dioxide. In order to perform this particular activity, people need to reduce the use of cars and any other motor vehicles that may provide an ample amount of carbon dioxide in the environment. Along with that, people also need to identify the main reasons behind the death of the coral reefs. Based on the identification of the cause, they may use a proper process that can enhance the lifespan of a coral reef. In addition to that, the people need to reduce the amount of extraction of trees in the ocean areas. Loffler et al. (2015) said that it makes the soil loose enough to be wiped away once a flow of water comes. In addition to that, as the coral reefs work as a natural medicine, therefore people need to restore this reef properly so that from the reef they can easily extract the different natural resources. However, the study lacks the ample amount of information regarding the global and the local reefs. The proper arrangement regarding the data set of reefs and the analysis of that data set can easily make the researcher able to find out the proper implication of the coral reefs over the human life. Along with that, the proper data analysis will also make the researcher able to find out the different issues that are related to the coral reefs. The entire study mainly deals with the current situation of the coral reefs and how their situation can get better has also been discussed. Along with that, the study also derives the main reasons behind the breakdown in the relationship in between the coral reefs and the algae. In addition to that, the study has also taken an ample amount of literature in order to study the exact situation of the coral reefs. The conditions of the coral reefs are being harmed by the high rise of temperature in the seawater along with the acidification of the ocean water. The study also provides a brief detail regarding the methods that have been used in order to complete the study. The methods include the approach that has been taken into account for the research process along with the proper research design. Moreover, the study also gives a brief image regarding the different activities that are required to be meeting in order to complete the research. Along with that, the budget that will be required for the successful completion of the research has also been discussed. This part of the study mainly provides the various tools and techniques that need to be used in order to conclude the entire study successfully. Along with that, the proper maintenance of the exact methodology provides a smooth path for the researcher in order to conclude the study. The research philosophy needs to be select properly. The researcher should use the positivism philosophy in order to understand the exact reasons that affect the coral reefs under the water. In addition to that, the proper research design also needs to be taken into consideration. Mackey and Gass (2015) said that the researcher should use the descriptive design that can make the researcher able to analyze a huge amount of data regarding the particular concept. In addition to that, the research approach also needs to be chosen in order to maintain the research plan. The researcher should use the deductive approach as this particular study mainly starts from a general point and the final result of the study mainly focus on the exact reaction that is caused regarding the approach. According to Flick (2015), the most important part is the collection of data set. The researcher should use the primary data collection method and use the qualitative method that makes the researcher able to have a proper interview session with the people who are at the top of the management in the coral reefs protection center. The interview is performed in between the managers, as they would be capable of answering the different questions regarding the situations of the coral reefs. Along with the fact, the managers can also provide an ample amount of knowledge regarding the fact that whether only the climate change is affecting the coral reefs or not, or there is any other factor that affects the coral reefs under the seawater. In order to complete the entire research process, the researcher also needs to maintain the different ethical issues. The researcher should make sure one thing that the data set that has been gathered in order to analyze and derive the conclusion needs to be protected under the Data Protection Act 1998 (Smith, 2015). In addition to that, the researcher needs to take another thing under the consideration that there would be no exchange of money during the entire process of data collection. Along with that, the researcher also considers the fact that the managers need to be aware regarding the exact cause of the interview. Moreover, there are certain amounts of limitations regarding the proper conduction of the study. One of them is the shortage of the time. The time is not enough sufficient in order to conduct the study. Along with the financial requirements also needs to be taken into consideration. As the different processes such as the use of qualitative techniques can be handy for the researcher, therefore it would take a proper amount of money regarding this aspect (Panneerselvam, 2014). Moreover, the researcher also have to face some type of difficulties regarding the collection of the data set from the managers as they are not always available and sometimes they also ignore in order to provide a sufficient level of information. Like every research paper, this particular also needs to go through with the different activities in order to complete the research process smoothly. At first, there needs to be a proper selection of the research topic that can match with the requirement of the society. In order to select a proper topic for the research purpose, the researcher needs to communicate with the teachers and take their suggestion regarding the matter. After choosing the proper title for the research, the researcher needs to gather an ample number of literary sources that can help in order to generate an ample amount of knowledge regarding the topic. Panneerselvam (2014) said that, after analyzing the literary sources, there needs to be a proper selection of the research methods that need to be use3d in order to complete the study successfully. Then it comes to the collection of relevant data sources. The dataset can help the researcher to conduct the entire set of study in a proper manner and extract a proper result for the analysis of the data set. After analyzing the entire data set, the researcher comes to the summarization of the research and provides a proper conclusion regarding the research topic. Below table provides the time required for each of the activity. Budget is the most important thing that the researcher needs to take into the consideration in order to complete the study. The researcher needs to allocate a proper amount of budget in order to gather the different literary sources. Some of the secondary sources are available online, however, few are not. Therefore, it takes a certain amount of budget from the researcher. Along with that, a small portion also needs to be allocated in order to maintain the research method. When it comes to the data collection and the proper analysis of data, the researcher needs to allocate a fair amount of budget, as it is the most important part of the study. According to Smith (2015), the different statistical tools that need to be used in order to analyze the data set also take away some amount of money. Below table provides a brief description of the budget planning. Berumen, M.L., Hoey, A.S., Bass, W.H., Bouwmeester, J., Catania, D., Cochran, J.E., Khalil, M.T., Miyake, S., Mughal, M.R., Spaet, J.L.Y. and Saenz-Agudelo, P., (2013). The status of coral reef ecology research in the Red Sea. Coral Reefs, 32(3), pp.737-748. Bourne, D.G., Ainsworth, T.D., Pollock, F.J. and Willis, B.L., (2015). Towards a better understanding of white syndromes and their causes on Indo-Pacific coral reefs. Coral Reefs, 34(1), pp.233-242. Brandl, S.J., Hoey, A.S. and Bellwood, D.R., (2014). Micro-topography mediates interactions between corals, algae, and herbivorous fishes on coral reefs. Coral Reefs, 33(2), pp.421-430. Brooker, R.M., Munday, P.L., Brandl, S.J. and Jones, G.P., (2014). Local extinction of a coral reef fish explained by inflexible prey choice. Coral Reefs, 33(4), pp.891-896. Chong-Seng, K.M., Nash, K.L., Bellwood, D.R. and Graham, N.A.J., (2014). Macroalgal herbivory on recovering versus degrading coral reefs. Coral reefs, 33(2), pp.409-419. Davis, J.P., Pitt, K.A., Fry, B., Olds, A.D. and Connolly, R.M., (2014). Seascape-scale trophic links for fish on inshore coral reefs. Coral Reefs, 33(4), pp.897-907. Den Haan, J., Visser, P.M., Ganase, A.E., Gooren, E.E., Stal, L.J., van Duyl, F.C., Vermeij, M.J. and Huisman, J., (2014). Nitrogen fixation rates in algal turf communities of a degraded versus less degraded coral reef. Coral reefs, 33(4), pp.1003-1015. Depczynski, M., Gilmour, J.P., Ridgway, T., Barnes, H., Heyward, A.J., Holmes, T.H., Moore, J.A.Y., Radford, B.T., Thomson, D.P., Tinkler, P. and Wilson, S.K., (2013). Bleaching, coral mortality and subsequent survivorship on a West Australian fringing reef. Coral Reefs, 32(1), pp.233-238. Fulton, C.J., Binning, S.A., Wainwright, P.C. and Bellwood, D.R., (2013). Wave-induced abiotic stress shapes phenotypic diversity in a coral reef fish across a geographical cline. Coral reefs, 32(3), pp.685-689. Glynn, P.W. and Manzello, D.P., (2015). Bioerosion and coral reef growth: a dynamic balance. In Coral reefs in the Anthropocene (pp. 67-97). Springer Netherlands. Graham, N.A.J. and Nash, K.L., (2013). The importance of structural complexity in coral reef ecosystems. Coral Reefs, 32(2), pp.315-326. Jackson, J., Donovan, M., Cramer, K. and Lam, V., (2014). Status and trends of Caribbean coral reefs: 1970-2012. Global Coral Reef Monitoring Network. Kemp, D.W., Thornhill, D.J., Rotjan, R.D., Iglesias-Prieto, R., Fitt, W.K. and Schmidt, G.W., (2015). Spatially distinct and regionally endemic Symbiodinium assemblages in the threatened Caribbean reef-building coral Orbicella faveolata. Coral Reefs, 34(2), pp.535-547. Lantz, C.A., Atkinson, M.J., Winn, C.W. and Kahng, S.E., (2014). Dissolved inorganic carbon and total alkalinity of a Hawaiian fringing reef: chemical techniques for monitoring the effects of ocean acidification on coral reefs. Coral Reefs, 33(1), pp.105-115. Loffler, Z., Bellwood, D.R. and Hoey, A.S., (2015). Among-habitat algal selectivity by browsing herbivores on an inshore coral reef. Coral Reefs, 34(2), pp.597-605. Panneerselvam, R., (2014). Research methodology. PHI Learning Pvt. Ltd.
Smith, J.A. ed., (2015). Qualitative psychology: A practical guide to research methods. Sage.